The root of the problem, or at least another serious symptom of it, if we read on, is insufficient respect for professors (the author is one) and academic values. I'm willing to buy that to some level, i.e. work / study programs are indeed important in fighting obsolete conditioned reflexes. Even though I only climbed the degree ladder so far, I still believe in ladders and climbing. This attitude of "dismissing [other countries] as lesser beings in terms of intelligence and accomplishment" is one optional aspect of what I'll call patriotism, not necessarily mentally healthy but also potentially innocuous. One needs a home team to root for, be that a home state, school or company campus. Patriotism traces to an internal "private sky" i.e. a "virtual country" or "land" which we sometimes think, in all innocence, is widely shared and well understood by "the masses" (i.e. "other people") -- a step towards nationalism's stronger need for literalism and one conception of reality uber-alles. A self-conscious patriot embraces solipsism, not as a factual truth, but as a constructivist premise. One constructs one's own reality, meaning one's country within one's world, which all has a "might have been" (subjunctive) flavor. In actuality, it's the call of a higher Self that we answer and serve, toward some greater glory. We seek a larger more cosmic purpose, however that manifests (for some, as a nation, for others as corporation or a religious institution -- some converge all of these in some multi-faceted bliss). Thoughts about the inferiority of "other countries" need not go with the territory, but often do. We certainly feel more "at home" in whatever "homeland" is ours, by definition. Americans indulge themselves with permission to see themselves as "ahead of others" as "the wealthiest nation", as a "superpower". They're groomed to think in those ruts by generations of Manifest Destiny rhetoric, in my book a root cause of the very idiocy this author is talking about. Indeed, when we lose the psychological and subjective dimension of a promised or promising land, and project our sense of "country" as an "objective nation" on the world stage, then our tone may become more authoritarian and defensive, as the memes of Nationalism creep in. Citizenship may become more of an entitlement, but also an obligation. Others may need you to die for them. The company may need you to be a hero in some way. Here is where defending one's country, remaining patriotic, may mean going against the expectations of a mere nationalist crowd or mob. Nationalism is too shallow to comprehend a deeper patriotism. When patriotism turns to nationalism and requires us to become more obsessed with borders and taking our inner life more literally, that's when we start building physical walls and other such barriers. Whereas anyone may have a virtual country to serve, a whole planet by default, a nation requires political theater, i.e. concerted acting out. More props come into play, such as visas and passports. Was there ever a time that the United States was in any position to "dismiss as lesser beings" these other nations? What has been the trajectory on the world stage so far? Certainly individuals may be inventive but nation-states are legal fictions and devoid of personality, inasmuch as corporations are, or do we think only nation-states have what we now call corporate personhood? Have we worked out what that means? What are the metaphysical implications? The USA was hammered together by many groups who'd been rejected or were on the run from the more dominant societies of Europe. These were refugees, many of them impoverished. The Statue of Liberty was their beacon later on, but the flight of outcasts and disowned did not begin with the installation of that statue. We tell the story of the Mayflower. Pilgrims were seeking new freedoms. Lets try on for size that the USA was populated by some of the least socially adjusted, who then became further brutalized in prosecuting a form of genocide against native populations. The collective IQ of America, so-called, has therefore always been exceptionally low. As a nation, the US has always been at best a bold experiment, but in many chapters was more of a basket case, unable to exert self control or stop itself from gross misdeeds. Lets see the US as "most retarded" if only in the name of "tough love" (back to patriotism). That's how this book is having us see Americans too, as losers, with some advice on how to again win. 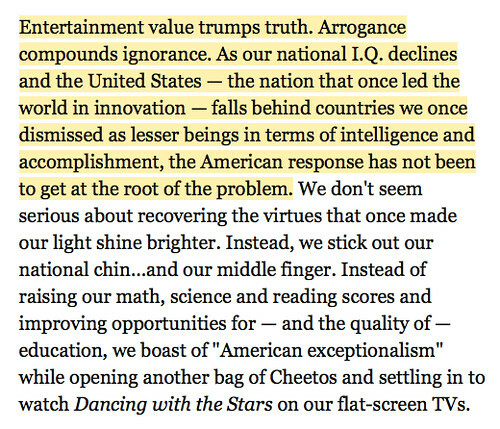 Do we "boast" of American exceptionalism (last quoted sentence)? I always considered it more of an accusation. Americans are too absorbed by "ahead of" and "behind", dissing and dismissing the "behind" while being "number one" i.e. a "superpower" in their own not so powerful minds. Even with the cult of individual initiative and doing it one's self (rebellious independence), "Americans" as a population still take credit for and thereby socialize the accomplishments of individuals and suddenly it's some "we" that's innovative. Aren't individuals the entities who are innately innovative? How is it that fictitious beings are innovative? Lets give credit where credit is due: to humans, not their own contrived institutions (which humans invented). Patriotism supplies the personhood. People have the same sense of patriotism about their companies, so the fact that sovereignties are getting put in their place by the supranationals makes some sense. The playing field has leveled more. As long as we're in the realm of fictitious personhood, more than just nations can play. Nationalists are more puzzled by these developments than more self-aware patriots. Patriots understand the "love of country" involves a more metaphoric use of "country" with arrows pointing inward. Nationalists are too dull to get that and project their inner dynamics outward, expecting the world to reflect their own internals by proxy. In forgetting the power of psychology, they become its victims, its puppets, its idiots. A nationalist is someone who believes in nations. A patriot serves a higher selfhood without necessarily believing so hard, without adhering so strongly to contemporary dogmas about just what or where those nations are. Those nations may be just political theater, often farcical and fleeting, strutting and puffing their hour upon the stage.